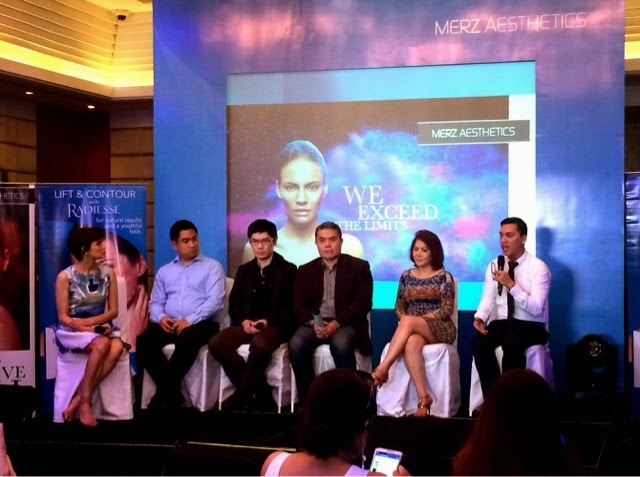 Rushed to Makati so I could catch an event by Merz Aesthetics, a branch of the brand Merz who's one of the leaders in aesthetics and consumer health. They talked about aging, a fact that nobody accepts in this day and age but eventually have to face because of stress, exposure to the sun, lack of sleep and negative outlook in life. It all contributes to the word OLD and the other 3 letter word called AGE, we have to face it eventually so in this occurrence you'll have soft tissue quality, facial bone loss, muscle and ligament loss of control because of gravity. At this time, people get deep wrinkles, thick skin, laxity, impaired healing, sagging eyelids, need I say more? What would be the treatment? It starts from taking care of your skin, a change of lifestyle, hydration and a healthy diet. The key here is prevention, says Dr. Ferraris from UERMMC. She adds the process also of looking good makes one feel good. It has to come from inside, it's our nature to actually do it. 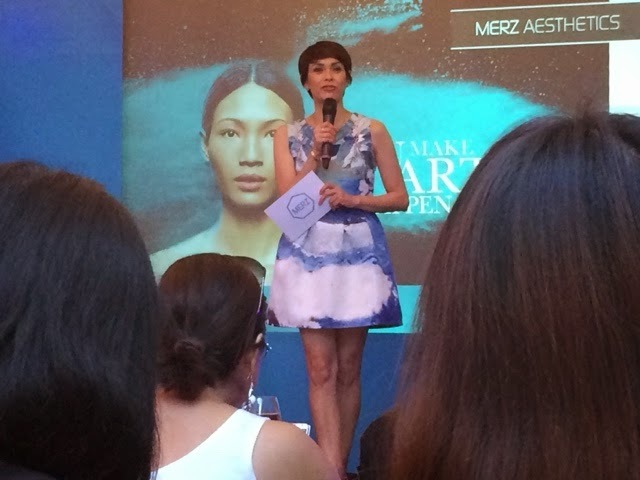 From applying make up, getting things done through surgery and aesthetics. Invasive or non invasive, it all boils down to your own value of symmetry and not get far with your self esteem issues. Having exercise, aesthetic medicine, are all part of it and must have improvements in order to cure depression and have self esteem. In the Philippines it's only in it's infancy and not a lot of people undergo procedures. Though they should be screened properly before having it so it won't be an addiction. Treating patients psychologically before procedures is a must so their standards and acceptance would be in tune and not get dimorphism. 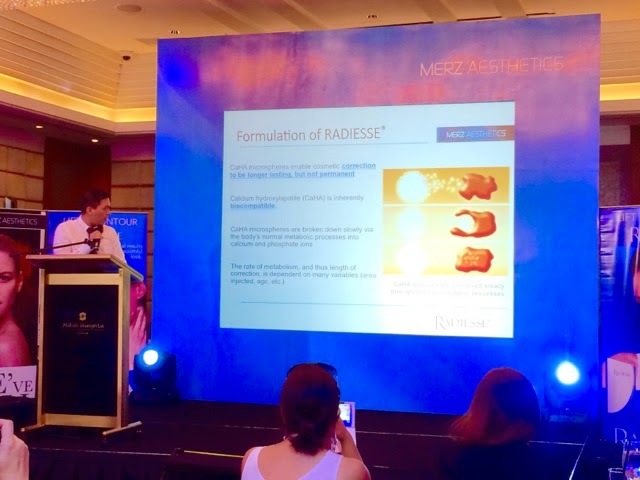 Merz has a product called Radiesse that has got long term collagen stimulation. It's the filler, a gel like component in this product that naturally blends with the collagen of the face to add volume. It looks natural, and its effects are long term. Once a doctor administers this to you, you won't be seeing much of the wrinkles and lines, have that immediate lift and have it for the years to come. Radiesse has been used for a long time and has defied age for thousands of women around the world. They have made clinical tests, studies and proven safe by a lot of publications around the world! The better lift and contour would make you feel better, even look better and be better inside. These fillers are injected for volume enhancement to change the face shape and we even saw some celebrities from Taiwan use it, almost no complications and very minimal recovery time. They also look quite natural and people couldn't tell actually. It's that big of a change but not these are not dangerous. Unlike some medical practitioners who use silicon oil that can cause cancer in a lot of cases. So make sure you study and judge what you can only use safely okay? If some people offer you for a very small fee, call it collagen and use silicone oils, don't do it! People have died from that already. Make sure you only get medical grade ones and trusted by the public. It's your face anyway!